EU leaders insist they will not change the legally binding Brexit withdrawal agreement. 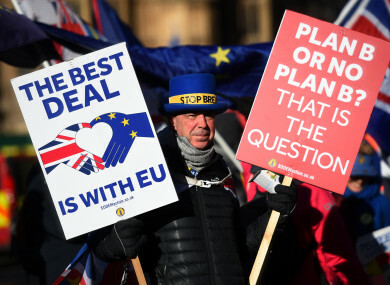 Anti-Brexit campaigner Steve Bray holds placards outside the Houses of Parliament, London. DUP LEADER ARLENE Foster has said her party is giving its endorsement to a proposal dubbed as a compromise in British political circles which would see the backstop replaced by “alternative arrangements” and the transition period extended to 2021. In a statement Foster said the DUP believes this proposal can “unify a number of strands in the Brexit debate” and provides a “feasible alternative” to the backstop. The first part of the so-called compromise is Conservative MP Graham Brady’s amendment, which deals with redrafting the backstop is now expected to be backed by his party – if speaker John Bercow selects that amendment for debate and a vote later tonight. Prime Minister Theresa May appeared to agree, urging Conservative lawmakers to back Brady’s amendment in order to send a clear message to the EU. She made the comments at a meeting with backbench Conservatives, according to several attendees. Brexiteers led by Jacob Rees-Mogg’s ERG (European Research Group) were against it from the off, however. Since, they have said they are open to the ‘Malthouse’ agreement which is based on protocol drafted by ex-Brexit minister Steve Baker. It is so named because housing minister Kit Malthouse brought the remain and Brexiteer sides together for talks in the past few days. Arlene Foster said today that this Malthouse proposal would offer a route towards negotiating a future trade relationship between the United Kingdom and the European Union. There is no better time to advance this alternative given the confusion and disarray which is now manifesting itself in Brussels. She said this confusion at been displayed both by “contradictory EU statements” and what she described as “the panic stricken behaviour of the Irish government”. The stance of the European Union in relation to the backstop has not changed, however. She warned that Britain risked crashed out of the EU without a deal “by accident” because London cannot decide what it wants. Ireland’s Minister for European Affairs Helen McEntee also called for “realism” from London. “There can be no change to the backstop. It was negotiated over 18 months with the UK and by the UK,” she said. Brady’s backstop proposal is one of more than a dozen amendments proposed by UK lawmakers that aim to alter the course of Britain’s departure. Some others seek to rule out a no-deal Brexit so Britain can’t tumble out of the bloc on 29 March without an agreement in place to cushion the shock. Speaker of the House of Commons John Bercow will announce today which amendments have been selected for debate and vote. - With reporting from AFP and Michelle Hennessy. Email “Arlene Foster endorses 'Malthouse' proposal for alternative to Irish backstop”. Feedback on “Arlene Foster endorses 'Malthouse' proposal for alternative to Irish backstop”.